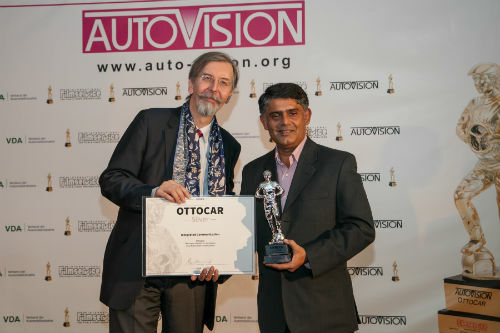 New Delhi: The ISUZU iV League campaign won the prestigious ‘Ottocar Silver Award’ at the AutoVision Awards 2017 held during the recently concluded International Motor Show (IAA) in Frankfurt am Main, Germany. ISUZU’s Communication Campaign to promote the iV League, the community of V-Cross owners in India, won the ‘silver’ in the category of Integrated Communication (Films and Videos as Part of a Larger Communication Campaign). AutoVision is the international festival for corporate films, commercials, TV programs, websites as well as interactive and multimedia productions in the automotive industry. The festival’s prestigious OttoCar trophies are awarded biannually to the most creative works in the industry. AutoVision is an initiative of Filmservice International and it is supported by The German Association of the Automotive Industry (VDA). The ISUZU iV League campaign showcases the initial V-Cross owners in India in an interesting manner and the campaign videos capture them in their daily lives enjoying their V-Cross Adventure Utility Vehicle. The iV League campaign, launched in November 2016 served as the starting point in bringing together the community of V-Cross owners in India and helped establish a unique brand identity for V-Cross and ISUZU in the Indian market. Visit www.isuzudmaxvcross.in/iV_League for more information and videos from the iV League campaign. The iV League films have been produced by Hansa Vision India Pvt Ltd., one of the leading Ad agencies in India. Launched in May 2016, the ISUZU D-MAX V-Cross is India’s first Adventure Utility Vehicle and is available at 27 dealerships of ISUZU across India. Powered by a 2.5 litre VGS Turbo Intercooled diesel engine, the V-Cross is a highly capable off-roader with a ‘shift on fly’ 4WD for the adventure seeker as well as a premium SUV for the city slicker who wants to stand out in the crowd of SUV owners.